The following is slightly edited from an actual email I sent to the public editor of The New York Times about a story in the September 23 edition about a community conflict in Brooklyn — a flash point for gentrification in the last decade — over the plan to send white students to a predominantly minority school. The New York Times is a great newspaper; I grew up reading it and still get home delivery at 58 years old. But sometimes its quest for “balance” and neat narrative can be tortured and unsupported. But the story doesn’t quote a single P.S. 307 parent voicing that “worry.” What they did say is far more revealing, but does not fit the neat narrative of resistance to integration coming from both black and white families. The writer summarizes the concerns expressed at a meeting as parents voicing fears “that their children would no longer be allowed to attend P.S. 307,” not as a resistance to incorporating wealthy white kids into their classrooms. And the only actual quote from a 307 parent at this meeting can be read in that context: The parent says she “has no problem working with anybody,” but says, “I’m not going to let anybody take from my daughter.” So she isn’t resisting integration; she’s fearful her school will be ripped out from under her. The end of the story even quotes a parent at P.S. 307 inviting the white parents to visit, and to “stop looking down on one another.” Where’s the worry that white families will change the school? This story hides the racism and entitlement of white parents behind a veneer of “both sides” having prejudices, and ignores the voices who are telling The Times that when white needs bump up against their community they lose. It is doing the P.S. 307 parents and Times readers a disservice. 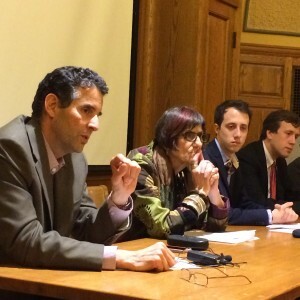 Will the Real Expressive Individualist Please Stand Up? But why lump US Senator Bernie Sanders in with a pair of politically inexperienced party-disrupting American loud-mouths? The subtle dig at Bernie Sanders has become something of a New York Times pastime, but this one is particularly mind-numbing. Sanders has “experience” governing going back to 1981 through two of our three branches of government. I have written in this space before about how Sanders ran the city of Burlington, Vermont with stunning efficiency. I think he may even have surprised himself with his focused management, knack for hiring great administrators, and his buck-stops-here approach, making sure that streets were plowed, garbage picked up, and citizens’ complaints were handled and resolved quickly and respectfully. Say what you want to about his lowercase “s” socialism, but this guy proved in his stint as mayor that he knows how to run an executive branch – albeit in a small city. I’m not suggesting that running one tiny, but thriving, city alone qualifies him to run the massive minefield known as the federal government. But Brooks is surely aware that Sanders has served a quarter of a century in the US Congress, which clearly qualifies as significant “experience” in governing. 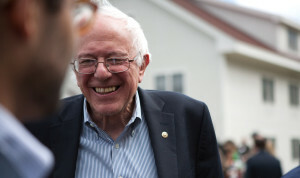 As a member of the legislative branch, Sanders distinguished himself for 16 years as Vermont’s lone US Representative and later as US Senator — always as a political Independent, which couldn’t have been easy. Despite philosophical differences with his colleagues in both parties, Sanders proved that he could work productively with people who don’t share his core beliefs, and that he could, well, govern. So I had to take a couple of deep breaths before deciding to forge on. Brooks rewarded my persistence with more politically blindered hot air, when it finally occurred to me that he has it topsy-turvy. In other words, someone who campaigned on the theme of bipartisanship, someone who repeatedly said: “We aren’t red states. We aren’t blue states. We’re the United States”? Someone who held dear to his belief, against all evidence and odds (and probably to a fault), that he could find common ground with his political opponents? Did Brooks forget that guy already? Perhaps that’s another reason these “anti-party” juggernauts have hit a nerve: even the most politically mature voters, those of us who understand the art of compromise, have seen how this plays out. Brooks’ nostalgic vision is as outdated as the old Kremlin Hot Line. If the last 7 years prove anything, it’s that the winners in Washington are the ones who shout the loudest. As voters, we’ve been taught, carefully taught, that if we want to elect leaders who reflect our own values, we have no choice but to align ourselves with the candidate with the biggest megaphone. Though I fear that the conventional wisdom is right — that Sanders is too far out of the mainstream to be elected — his surprisingly successful campaign to date isn’t because of some “expressive individualism” taking root among the rank-and-file. It’s a recognition by his supporters that it’s our standard issue elected officials themselves who have drank the “expressive individualism” Kool-Aid, and are behaving, not as some “citizens of a joint national project,” but as if they have, in Brooks’ words, “congregate[d] in an ideological bubble,” convinced that “the purest example of their type” will win. The anti-partiers are among the members and leadership of the House and Senate. Trump and Dr. Carson are just screaming to get in. 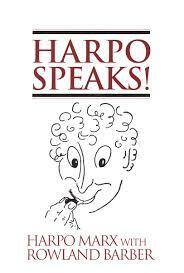 I never thought of Harpo Marx as a personal inspiration until recently. And this jumpin’ jack flash of insight hit me with a revelation that also explained my fascination with the genius of Keith Richards. Let me explain. Harpo, of course, did not “say the magic word” and therefore did not win $100. After looking for a copy at the Best Used Bookstore in Connecticut, Niantic’s Book Barn, I did the next best thing: I requested it from the public library system. Two days later I couldn’t stop reading it. From second grade on, when he dropped out after tossed from the first floor window of his school, Harpo, like his other brother Chico, could do nothing less than follow his own inner voice. He proudly describes a lifetime of gags, antics, practical jokes, imitating other people, teaching himself how to play the harp … all while becoming the best comedic mime of the 20th century. 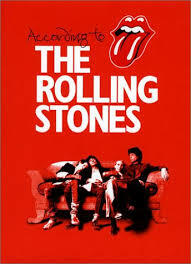 What does this have to do with the better half of the Glimmer Twins? Since he learned to play guitar, Keith Richards never wanted to do anything else but play rock & roll. He didn’t pay much attention to social conventions, or follow anything close to a traditional path. Yes, it nearly killed him, but that isn’t the point. It also led to blending R&B, blues, country and British Invasion pop to creating one of the greatest bodies of work in popular music history. Genius is like that. When I was in high school my father used to go to meetings on Wall Street wearing inside-out t-shirts. They were leftovers from my brother’s cast-offs of rock & roll swag. (The one I remember best had a photo of Paul Anka with the tag “I Don’t Like to Sleep Alone.”) Then he got so successful he felt like he had to dress the part. I always felt a little sad about that. It’s barbecue time. When you find yourself gathered with family and friends, sharing a glass of something cool and refreshing, someone is bound to proclaim that, as a moderate Republican, Jeb Bush is an acceptable alternative to the Democrats. After all, he supports the Common Core standards, and would like to pass some sort of immigration reform. They read that Bush is a moderate in the paper, or heard it on the news, so it must be true, right? Bush supported the Iraq War. Bush was in the news this week, back-pedaling from a statement he made on Fox News in which he said that had he been president in 2003, he would have invaded Iraq. But don’t be fooled by his claim of having misunderstood the question. Jeb Bush was and still is ideologically in line with his brother’s zealously hawkish foreign policy team (some of whom are on a list of his advisors for his presidential run). 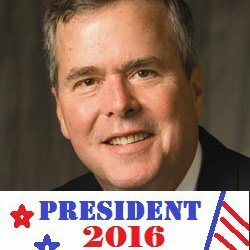 In the late ‘ 90s Jeb helped found the Project for a New American Century (PNAC) that called for the overthrow of Saddam Hussein. Founding members included Donald Rumsfeld and Paul Wolfowitz. Remember them? He is anti-abortion. As governor, he was proud of passing restrictions on abortion rights, including regulating abortion facilities, because he wanted “to create a culture of life in our state.” In early May, an advisor declared that Bush advocated de-funding Planned Parenthood. Jeb “Stand Your Ground” Bush loves the NRA. “I will match my record against anyone else when it comes to support and defense of the Second Amendment,” Bush said at the National Rifle Association convention last April. According to a story in USA Today, Bush’s speech included a swipe at President Obama over gun rights: “Why don’t you focus more on keeping weapons out of the hands of Islamic terrorists and less on keeping them out of the hands of law abiding Americans?,” he said. For Bush, education reform has been fueled by corporate profits. 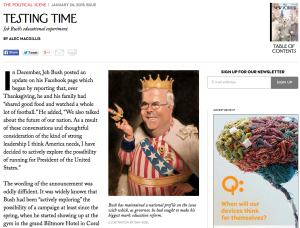 Bush’s much-hyped education record in Florida has had mixed results, according to this in-depth story in The New Yorker. It also reveals that it is deeply entwined with helping his corporate backers make lots and lots and lots of money. As Watergate taught us, the best way to assess a politician’s true colors is to follow the money. Beer isn’t wine. Watches aren’t computers. Chamber music should be played in Volvos. Three wonderfully creative ads have popped up this year, each lampooning pretension. Knocking elites has always a good strategy for politicians looking to woo working class voters, so these ads from Budweiser, Shinola, and Dodge are very likely foreshadowing a major theme of the guaranteed to be interminable 2016 presidential campaign. You don’t swish and sniff and sip and spit when you sample beer. And if you do, well, you’re not going to be drinking “macro-brewed” Bud anyway. Yes, Budweiser knows its brand well — that’s why its controversial “Brewed the Hard Way” Super Bowl ad is now running during baseball games. 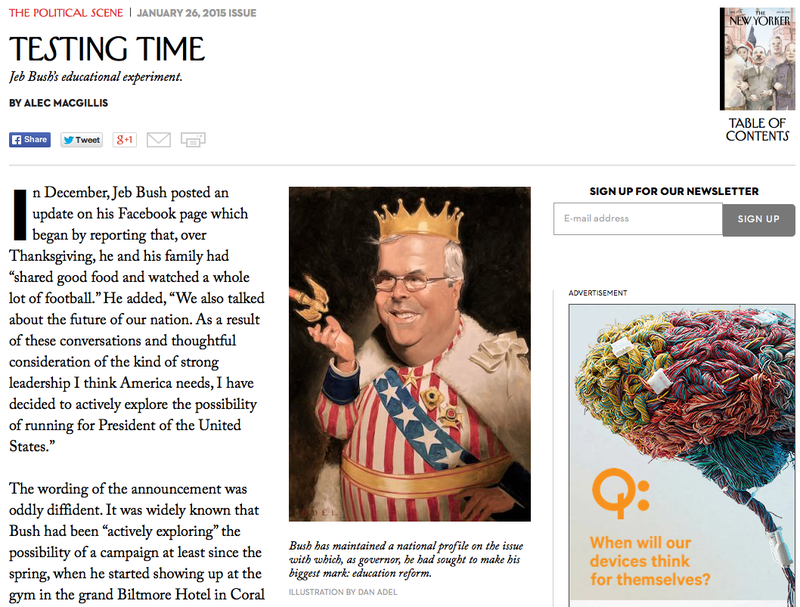 Even more brilliant is this wonderful hijacking of the Apple watch rollout that ran in The New York Times. Shinola, a company at the epicenter of the Detroit renaissance, produces inspiring classic designs of watches, leather goods, and bicycles. Shinola is appealing because it makes things right here in the USA, simultaneously representing the heyday of American manufacturing, and a new, creative-class driven future. It’s a tomorrowland in which a $550 watch that doesn’t connect with your pocket-sized computer is more desirable than a $375 watch that does. At these prices, the target consumer here isn’t exactly blue collar, but the ad nevertheless joyfully thumbs its nose at elitist trend-followers. The ad is a masterstroke of anti-elitism elitism — poking fun at Apple’s design snobbery in order to attract people so hip they can afford to reject it, both culturally (it’s a badge signifying the wearer’s do-good bonafides) and economically. I’d take my hat off to them if only Shinola was also reinventing the Fedora. I’ve been guilty of anti-snobbery snobbery on occasion, too, labeling someone or other as an NPR-listening liberal (somehow the worst kind). 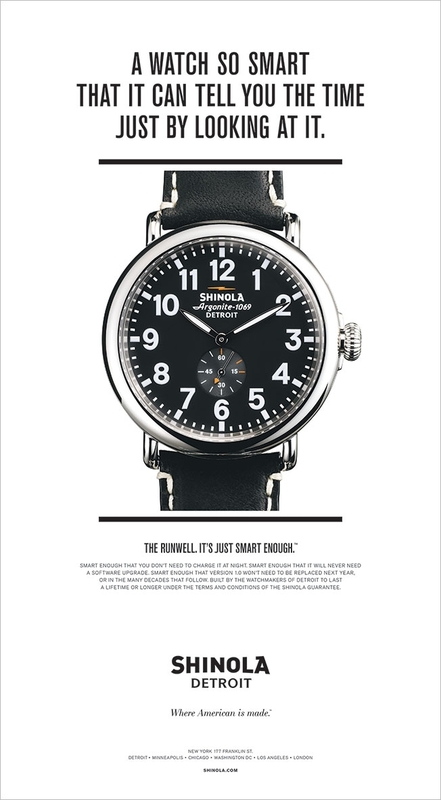 Shinola clearly has someone with my taste and politics in mind (only with an extra digit or two in their bank account) when they design their retro-yet-modern product lines, and especially when they develop their marketing plan. Anti-intellectualism and anti-elitism are the common thread among the far-right populist uprisings, especially among those who are too glibly described as Fox-news-watching conservatives. While to that crowd Obama is extra uppity because he is an unabashed egghead, the urge to thumb our collective noses at smart people doesn’t always recognize cultural divisions. Kids in all kinds of schools reportedly worry about being too bookish. And expertise is derided from both libertarian-leaners and the loony left: Climate change? What do those Ivy League scientists know anyway? Vaccines? Not for my kids. But anti-intellectualsim and anti-elitism are not the same thing. George W. Bush is as elite as they come — son of a president, and Ivy League educated. But his, and Karl Rove’s, particular genius was that you can market these candidates any way you want. Bush, a smarter man than most on the left give him credit for, is no intellectual, which somehow made him immune to the charge of being elite. I prefer local, micro-brewed beer, especially Thimble Island Brewery‘s American Ale. But I have never sniffed it. I like Shinola’s watches. I’d probably buy one, too. If they were more affordable. I’m a proud Mini Cooper driver — no Dodge Challenger for me. And that’s not chamber music you hear when you pass me with my sun roof open, it’s Sondheim. Just to rub it in, when the Mini salesman was helping me set up the radio buttons, I asked him to set one to 90.5, the local NPR station. He looked at me knowingly. His smirk said it all. He didn’t have to answer. Memo to said salesman: I do not support Hillary Clinton.